The bulk of the maintenance that has been happening on this tank since October has involved topping up the evaporated water, filter cleaning, manually removing algae and water changes. One of the issues that the family which has the tank had was that topping up the tank with a bucket disturbed the substrate. I generally avoid the problem by balancing the bucket of new water on top of the tank and syphoning it in. This helps avoid spilling water all over the place and the water from the water butts tends to be freezing this time of year so I’m sure the fish appreciate not having a shock of cold water. Their solution is to place a mug in the tank and pour the water over that (similar to the plate suggestion that seems to be popular in books). In the mean time, the die back from the plants kept clogging the filter, which they started cleaning in old tank water, but then replaced the filter media altogether. Luckily this was before the fish were added, but I have reiterated the importance of not replacing the filter media in one go. The predominance of tap water top ups (we live in a hard water area) has caused the water in the tank to be quite hard, but this is likely to be beneficial to the plants in the long terms. At last water change yesterday, we removed 5 litres of water and added 20 litres. I have trimmed the Limnophila sessiliflora a few times and removed over twice as much Spirodela spp. 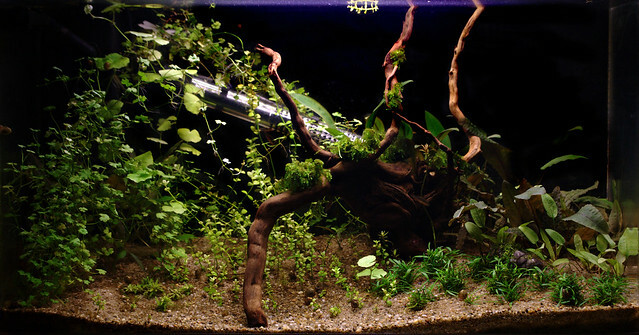 as I had originally added to the tank. 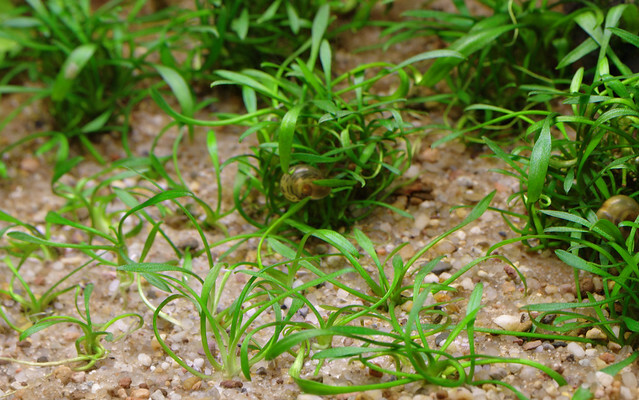 The Cryptocoryne wendtii ‘Tropica’ has shown good growth as well, although Crypt. sp. ‘Green Crisped Leaf’ has remained the same size but now has submersed leaf growth. I added four sera Floronette A root tabs, one under each of the Crypt. spp. and two spaced equally under the other plants. We also got a dark-blue on the bottom to blue on the top background for the tank and replaced the perspex lid with a glass one which is available for a shocking £20 from Arcadia. It works very well, but really should have come with the aquarium from the start. The glass lid is satisfyingly solid and easier to clean with vinegar than the perspex one. It has been almost a week since the Danios were added, they have settled in well and are relatively bold, but do not seem to appreciate when someone walks quickly across the room (as is expected). They certainly seem to enjoy the piece of wood, spending much of their time swimming through the holes in the base and around the stems, but do come right to the front of the glass when they notice me looking at them. The females are receiving plenty of attention from the males and one is looking considerably more plump now, so they may spawn soon. The fish found the flow of the filter to be disturbing, so I have attempted to slow it down by wrapping filter wool around the rough sponge and placing more still between the sponge and the bio media. It seems to have helped slightly, but not enough, so I am still thinking about how to slow it down further. The stand building project has come to a bit of a stand still as I am quite lazy, but this has given me an incentive to get it going again because the external filter has a 300 lph rating compared to the 700 lph that came with the aquarium. The fish are feeding well on frozen Daphnia and Artemia, with a supplement of high-protein granules and generic flakes. The 10 fish eat only tiny amounts, so even the smallest tub of fish food will last for years at this rate. Given that most fish food goes off in a matter of 1-6 months, it makes sense to separate it into smaller containers, freezing or chilling the majority of it until it is needed. There have not really been any major signs of algae, I am still cleaning off mild signs of diatoms from the glass every couple of weeks, but that is it. 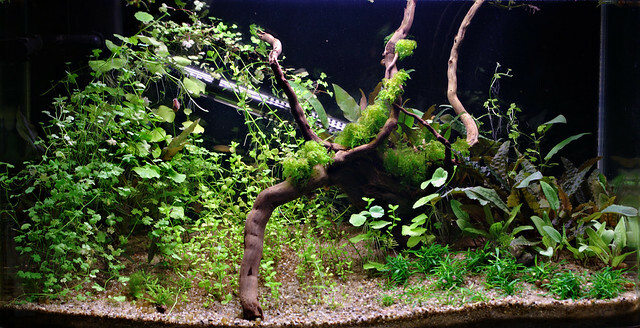 Most of the plants are doing well, and I plan to split up one or two of the Cryptocoryne parva bunches into individual plants over the next week. I was recently ordering some plants for another one of my aquariums, so decided to get some more for this one too. I bought Hygrophila polysperma, H. corymbosa var. siamensis and also added half a pot each of Cryptocoryne beckettii ‘petchii’ and C. wendtii ‘green gecko’, both of which I received as freebies.